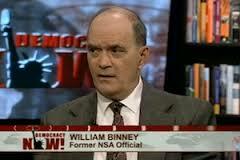 William Bin­ney is one of the high­est-lev­el whistle­blow­ers to ever emerge from the NSA. He was a lead­ing code-break­er against the Sovi­et Union dur­ing the Cold War but resigned soon after Sep­tem­ber 11, dis­gust­ed by Washington’s move towards mass sur­veil­lance. On 5 July he spoke at a con­fer­ence in Lon­don organ­ised by the Cen­tre for Inves­tiga­tive Jour­nal­ism and revealed the extent of the sur­veil­lance pro­grams unleashed by the Bush and Oba­ma admin­is­tra­tions. The NSA will soon be able to col­lect 966 exabytes a year, the total of inter­net traf­fic annu­al­ly. For­mer Google head Eric Schmidt once argued that the entire amount of knowl­edge from the begin­ning of humankind until 2003 amount to only five exabytes. by Oscar-nom­i­nat­ed US film-mak­er Lau­ra Poitras, described a future where sur­veil­lance is ubiq­ui­tous and gov­ern­ment intru­sion unlim­it­ed. He praised the rev­e­la­tions and brav­ery of for­mer NSA con­trac­tor Edward Snow­den and told me that he had indi­rect con­tact with a num­ber of oth­er NSA employ­ees who felt dis­gust­ed with the agency’s work. They’re keen to speak out but fear ret­ri­bu­tion and exile, not unlike Snow­den him­self, who is like­ly to remain there for some time. Unlike Snow­den, Bin­ney didn’t take any doc­u­ments with him when he left the NSA. He now says that hard evi­dence of ille­gal spy­ing would have been invalu­able. The lat­est Snow­den leaks, fea­tured in the Wash­ing­ton Post, detail pri­vate con­ver­sa­tions of aver­age Amer­i­cans with no con­nec­tion to extrem­ism. The lack of offi­cial over­sight is one of Binney’s key con­cerns, par­tic­u­lar­ly of the secret For­eign Intel­li­gence Sur­veil­lance Court (Fisa), which is held out by NSA defend­ers as a sign of the sur­veil­lance scheme’s con­sti­tu­tion­al­i­ty. A Fisa court in 2010 allowed the NSA to spy on 193 coun­tries around the world, plus the World Bank, though there’s evi­dence that even the nations the US isn’t sup­posed to mon­i­tor – Five Eyes allies Britain, Cana­da, Aus­tralia and New Zealand – aren’t immune from being spied on. It’s why encryp­tion is today so essen­tial to trans­mit infor­ma­tion safe­ly. Bin­ney recent­ly told the Ger­man NSA inquiry com­mit­tee that his for­mer employ­er had a “total­i­tar­i­an men­tal­i­ty” that was the “great­est threat” to US soci­ety since that country’s US Civ­il War in the 19th cen­tu­ry. Despite this remark­able pow­er, Bin­ney still mocked the NSA’s fail­ures, includ­ing miss­ing this year’s Russ­ian inter­ven­tion in Ukraine and the Islam­ic State’s take-over of Iraq. The era of mass sur­veil­lance has gone from the fringes of pub­lic debate to the main­stream, where it belongs. The Pew Research Cen­tre released a report this month, Dig­i­tal Life in 2025, that pre­dict­ed wors­en­ing state con­trol and cen­sor­ship, reduced pub­lic trust, and increased com­mer­cial­i­sa­tion of every aspect of web cul­ture. It’s not just inter­net experts warn­ing about the internet’s coloni­sa­tion by state and cor­po­rate pow­er. One of Europe’s lead­ing web cre­ators, Lena Thiele, pre­sent­ed her stun­ning series Net­wars in Lon­don on the threat of cyber war­fare. She showed how easy it is for gov­ern­ments and cor­po­ra­tions to cap­ture our per­son­al infor­ma­tion with­out us even real­is­ing. Thiele said that the US bud­get for cyber secu­ri­ty was US$67 bil­lion in 2013 and will dou­ble by 2016. Much of this mon­ey is wast­ed and doesn’t pro­tect online infra­struc­ture. This fact doesn’t wor­ry the multi­na­tion­als mak­ing a killing from the gross exag­ger­a­tion of fear that per­me­ates the pub­lic domain. Wik­ileaks under­stands this real­i­ty bet­ter than most. Founder Julian Assange and inves­tiga­tive edi­tor Sarah Har­ri­son both remain in legal lim­bo. I spent time with Assange in his cur­rent home at the Ecuado­ri­an embassy in Lon­don last week, where he con­tin­ues to work, release leaks, and fight var­i­ous legal bat­tles. He hopes to resolve his predica­ment soon. A core Wik­ileaks belief, she stressed, is releas­ing all doc­u­ments in their entire­ty, some­thing the group crit­i­cised the news site The Inter­cept for not doing on a recent sto­ry. “The full archive should always be pub­lished”, Har­ri­son said. With evi­dence that there could be a sec­ond NSA leak­er, the time for more aggres­sive report­ing is now. As Bin­ney said: “I call peo­ple who are cov­er­ing up NSA crimes trai­tors”.